Naomi Bates grew up in rural West Virginia and has a deep interest in Appalachia and other mountain communities around the world. Naomi’s graduate work focused on Appalachian Flood Hydrology and included extensive field work at the Fernow Experimental Forest near Parsons, WV. 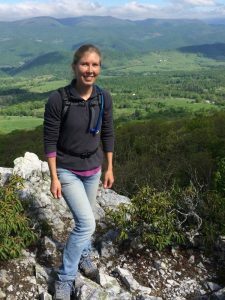 Naomi has worked for the USDA Agricultural Research Service, private environmental engineering consulting firms, the Delaware Geological Survey/University of Delaware, and the Stroud Water Research Center. Her background includes watershed hydrology, Geographic Information System (GIS), and extensive work with Light Detection and Ranging (LiDAR) elevation data. Naomi’s research interest include using science to empower communities, environmental monitoring and instrumentation, climate change, water and food security, LiDAR and GIS, watershed studies, anthropogenic and land-use effects on streamflow and flooding, hydrometeorology, geomorphology. From her background in environmental science and engineering, Naomi brings a strong desire to help bridge the gap between engineers and scientists and the communities they work with.